Visual Math academic edition. 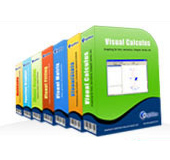 Visual Math help users to teach or study mathematics, including algebra, geometry, analytic geometry, solid geometry, calculus, statistics, complex variable function, fractal, curve fitting, probability analysis, linear programming etc. Implement data analysis and multivariate statistical analysis. 1. Probability analysis – compute and graph probability density function values, cumulative distribution function values, survival function values, hazard function values, quantile values, means and variances. 2. 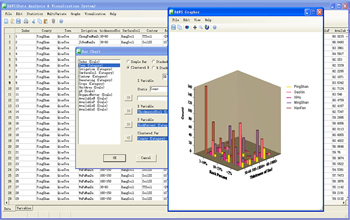 Compute descriptive statistics of selected data. 3. Frequency analysis. 4. Compare means – one sample t test, independent-samples t test and paired-samples t test. 5. Compare variances – one sample and two samples. 6. Variance analysis – one-way ANOVA and two-way ANOVA. 7. Z test. 8. Correlation tests. 9. Jarque Bera test. 10. Non-parametric tests, including one sample Chi-square test, two samples Chi-square test, one sample K-S test, two samples K-S test, sign test, Wilcoxon signed rank test, Mann Whitney U test. 11. Regression analysis, including univariate linear regression, multivariate linear regression, linear curve fitting, nonlinear curve fitting, trend surface analysis, stepwise regression etc. 12. Correlation analysis, including bivariate correlation analysis, partial correlation analysis and canonical correlation analysis. 13. Cluster analysis, including stepwise cluster analysis, hierarchial cluster analysis and dynamical cluster analysis. 14. Stepwise discriminant analysis. 15. Principal component analysis. 16. Factor analysis. 17. Correspondence analysis. 18. Statistics plots. 19. Data visualization. Learn to multiply large numbers in your head, up to many digits. ‘Multiply In Your Head’ helps you amplify your mental multiplication powers with ease. Keep track of your success rate and response time with the in built statistics. 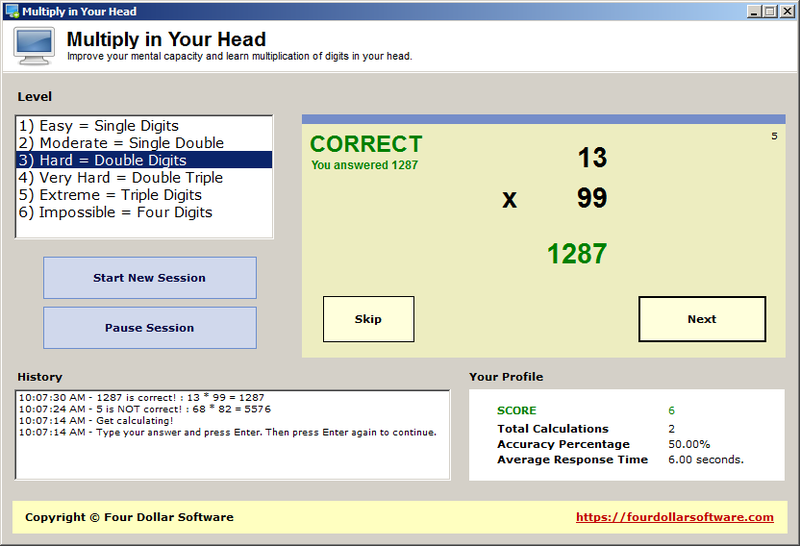 Watch your score improve as you become a more advanced mental multiplier. With 6 difficulty modes, from easy to impossible, this tool will help anyone test and improve their own mental tenacity. Draft Survey is a user-friendly draught survey calculation program for Ships Officers and Marine Surveyors. It is easily operated using either keyboard or mouse. Draft Survey complies with the latest UN ECE standards for Draught Surveying and CSS Code (Annex 13) and can print to all standard printer types. Draft Survey is a part of Maritime Software Suite along with Lash Calc and Route Planner marine calculation programs. 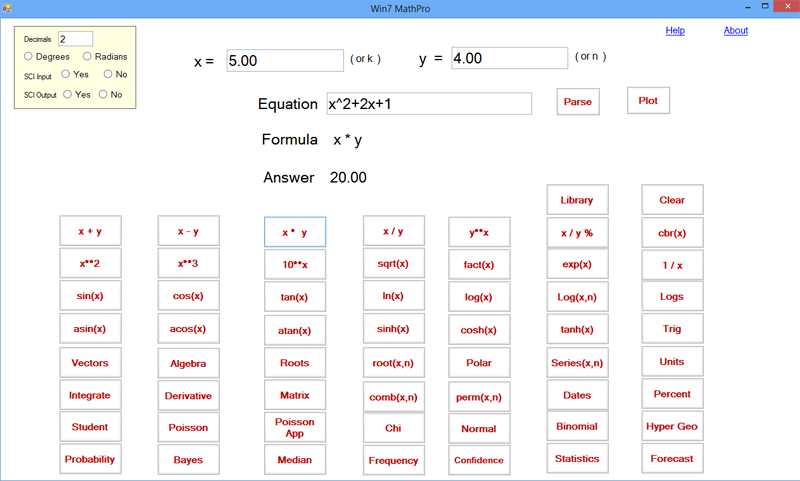 December 14, 2014 Home & Education, Mathematics, SoftwareAppricon Ltd. Analysis Studio provides the researcher a fast reliable way to create and manage data mining projects and includes automated methods for gaining a high level of accuracy and model stability. The software is designed for supporting crucial decisions in marketing, web mining, credit scoring, customer analytics, health science, human resources and other data driven fields. Analysis Studio features a fast deep logistic regression model development and deployment, regression analysis with multi model comparison, crosstab tables with multiple statistical measurements and graphical view, more than 25 charts, time series and forecasting wizards, seasonality detector, fractional polynomials, trend factors optimization, multi regressions optimization, cox regression and survival modeling, auto correlation wizard, built-in sensitivity for all regression types, built-in what-if for all regression types, multiple core computations for better performance. Analysis Studio can be used with multiple data sources from different vendors in the same project without writing any code (MSSQL, Oracle, MSExcel, MSAccess, text and xml files). The Analysis Studio free license includes all features with an unlimited number of variables and a 500 row limit per data set.